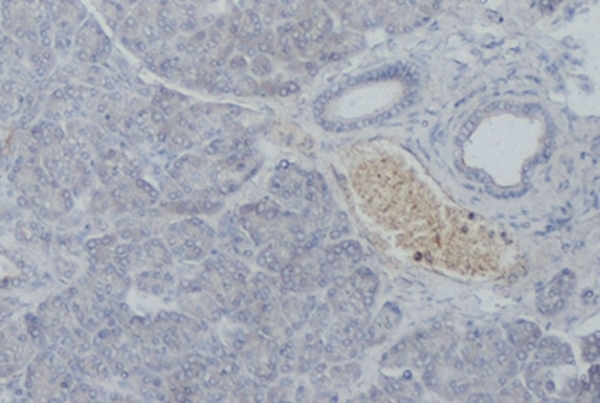 Paraffin embedded human pancreas stained with Mouse anti Human somatostatin receptor 5 antibody, clone sstr5 (MCA5923) followed by Histar Detection Kit (STAR3000A). No antigen retrieval was used. Mouse anti Human Somatostatin Receptor 5 antibody, clone sstr5 recognizes human somatostatin receptor 5 (SS-5-R), a 364 amino acid multi pass transmembrane glycoprotein receptor for Somatostatin-28 and to a lesser extent somatostatin-14. (SST) is a peptide hormone with wide ranging inhibitory effects on hormone secretion and cell proliferation. It is produced as a large preproSST precursor molecule that is cleaved to yield one of two active forms of the peptide: a 14 amino acid peptide (SST-14), or a 28 amino acid peptide (SST-28). The inhibitory effects of SST on hormone release and cell growth have made them candidates for the treatment of cancer and neuroendocrine disorders. Natural SSTs have very short half-lives, which led to the development of more stable synthetic derivatives, such as octreotide and lanreotide, both in common clinical use. Mouse anti Human Somatostatin Receptor 5 antibody, clone sstr5 specifically recognises SSTR type 5, but none of the other SSTR subtypes. Bio-Rad also has antibodies to SSTR subtypes 1, 3 and 4 (MCA5924, MCA5921, MCA5922) available.